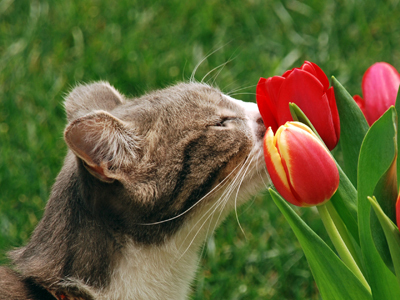 Stacey (President & CEO of PPAR) writes: " This entry is from Project PURR Animal Rescue. These are all rescued babies from gassing facilities in the South waiting on their forever homes. 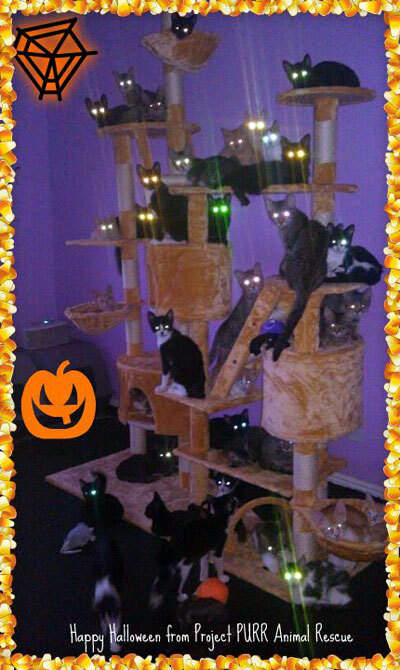 They wanted to wish everyone a Happy Halloween :) "
Congratulations Project Purr Animal Rescue! 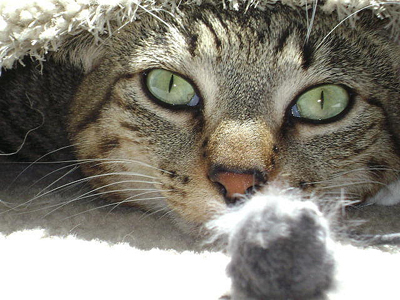 Jenny writes: " Smudgy was a rescue cat that I adopted. 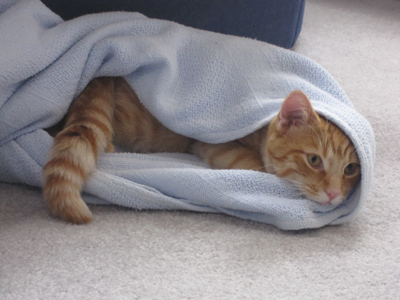 He was shy at first, but now that he is comfortable he is rambunctious and affectionate (after he is fed and content). " Steven writes: " Miley was rescued by my daughter in a Walmart Parking lot at an age of about 6 weeks old. She is very independent and strong minded. She loves small children more then anyone "
Jennifer writes: " Hi My name is Puff Puff, I am currently 10 months old and my mom Jennifer rescued me when I was only 4 weeks old, the mean people I was living with was not taking care of me at all and after she saved me I found out that my brothers and sisters died. When I came to live with my mom I was in very bad shape, She nursed me back to heath day and night, my mom is the best. I am a very happy little girl now, I love to play, my favorite toy is a metallic ball it sure does keep me busy for hours and hours. 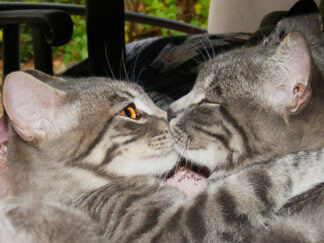 I live with 2 other cats who are older then me and I love to play with them as well. I talk a lot and my mom says I am never quiet. I love to talk to her when she gets home from work. 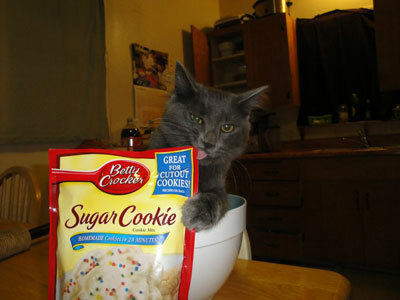 I hope you like my picture, mom was getting ready to make cookies and when she came back I was sitting in the bowl ready to help her! I would love to tell you more about myself. Meow Meow Puffy��. " 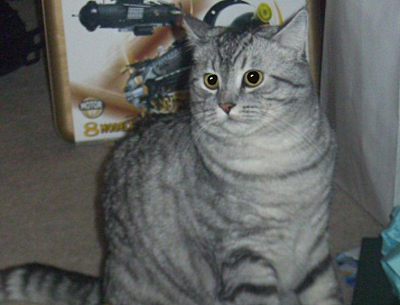 Beth writes: " He is gorgeous gray and white tabby, and he knows it! " 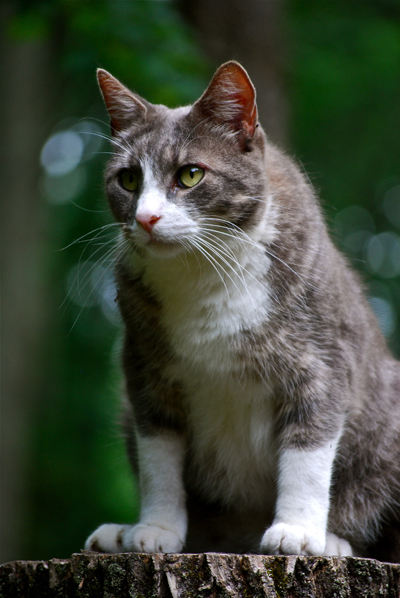 Andrea writes: " Sylvester was a stray that wandered into my garage and never left. 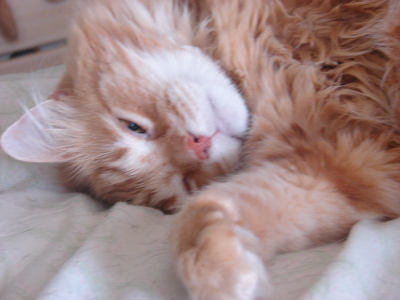 He was loved by me for 7 years before succumbing to lymphoma on 6/10/11. He survived 10 months on chemo treatments. He is an angel now. " 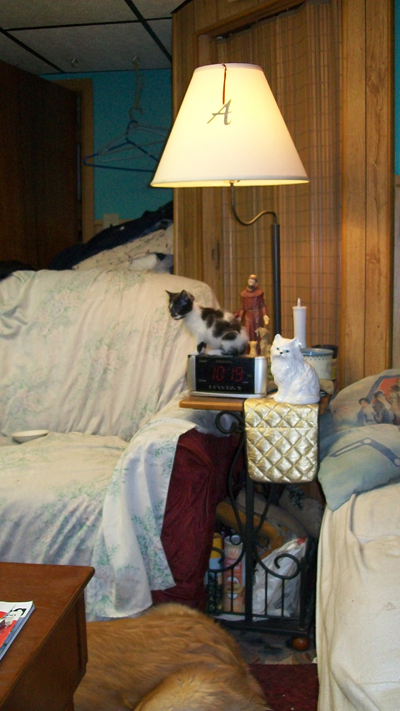 Corena writes: " Was owned by one other person for a year and given to me due to previous owner's boyfriend and daughter being allergic to cats, she also had long black hair like me and was in the military although she outranked me. Has been loved and cared for, for almost four years. He enjoys playing with his younger brother, Lucky who is 3 1/2 years old and fathers/mothers and befriends him. He demands attention and will even go as far as doing something naughty to get it. He takes great pleasure in accessing high places, from the closet to the very top of your front door to the fridge and down onto your counters, he will climb and jump. A gift for gab, he will tell you what is on his mind or when he is not happy or hungry, wants the kitty litter box changed. Sometimes I think he just likes the sound of his cat voice. 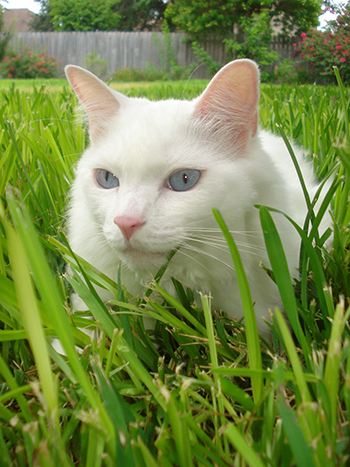 He loves the outdoors but alas mommy keeps him as an indoor cat. An escape artist at heart, sometimes he just wants a little adventure now and again and he gets it, despite mommy's constant vigilance. This photo is when mommy took him outside to the backyard on a cat leash and harness so he can get a sense of his new home (just recently moved). " 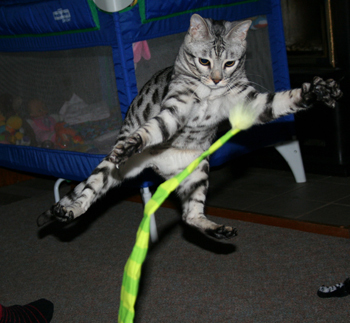 Matt writes: " This is Fritz, he is a one year old silver spotted bengal. We resucued him from a a not so nice breeder. He loves to chase toys! In this picture he seems to be saying "I got it now!" 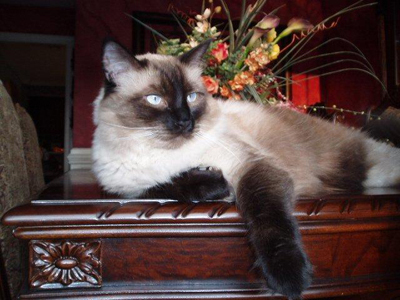 "
Hayley writes: " I adopted Chewy 6 years ago from the Humane Society of North Texas. At that time I had recently moved out on my own and went to the Humane Society to find a fury companion. As soon as I saw Chewy�s sweet face I knew I had to adopt him. I was shocked when they told me that he had been at the shelter for 5 months! I knew it was meant to be and took him home that day. 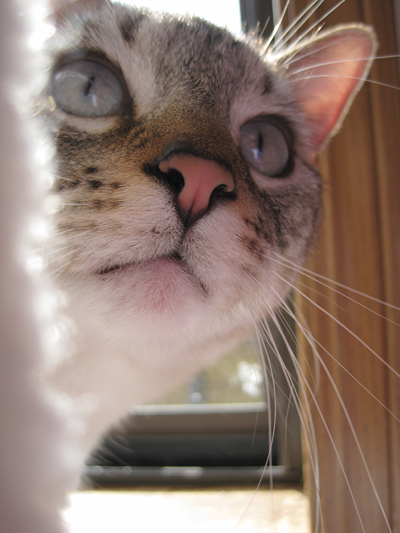 I call Chewy my �special needs cat� because he is on phenobarbital for seizures and Methimazole for his hyperactive thyroid. Other than that he is still going strong and is a great companion. " 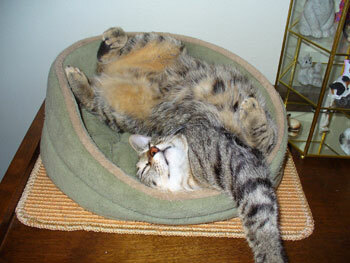 Libby writes: " Waffles is a rescue cat from the SPCA who loves laying on her back, inviting everyone to rub her tummy. Her favorite food is plain cat food! She refuses to eat anything that isn't her normal dry cat food and curls up behind the floor length curtains. She is sweet and patient with a loud and persistent meow! " 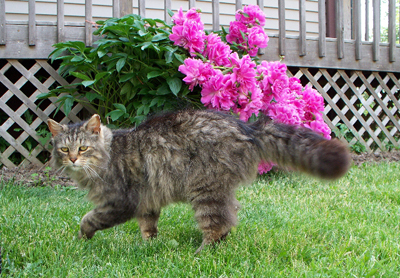 Brent writes: "This is a rescued alley cat that has been adopted and moved to the country. Whiskey has lived with us since he was about a year old. He is of course neutered, and a very good hunter. " Melissa writes: "Cocoa was found outside the local KFC. (Kentucky Fried Chicken) I found him near the door begging for food as customers went in and out of the establishment. I offered him a piece of chicken and we became instant buddies. 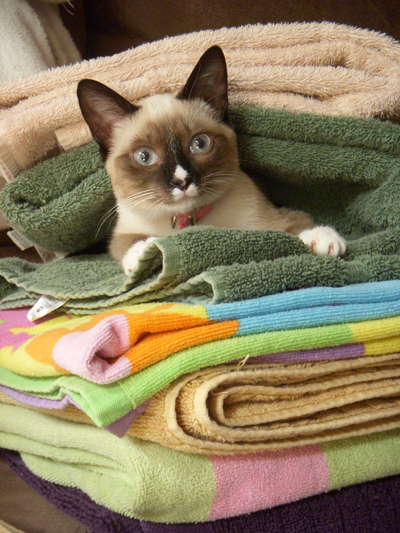 He has adapted very well with my two Meezers, (Siamese Cats). His favorite toy is a milk ring which he begs for every time a new milk jug is opened. He enjoys his time indoors, basking in the sun and watching the birds from inside. He is a real Mush! And guess what? He now HATES chicken and refuses to eat it. I'm sure glad I didn't name him Colonel. " Apryl writes: "My name is Apryl McLean, but my daughter, Antonia, took this picture. This is our cat Little Man. He will be one in April. He is a tabby/Siamese mix. We got a gray kitty last March and she ended up being pregnant. He was born in April and has been with us since. He plays fetch and loves his mommy. When he was born he was plain white, but as he grew his colors started to show. We hope you love him as much as we do! " Kira writes: " Puffy is a little mischief maker! She was the biggest of her litter, and she has a BIG attitude! We currently volunteer at our local hospice, visiting those in need and bringing smiles! 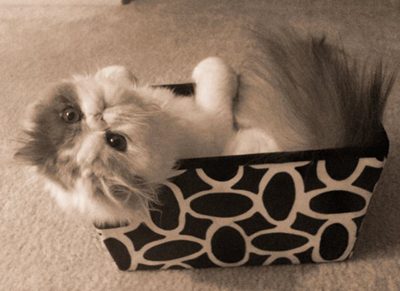 This is a picture of the Puff Monster in her toy box. " Stacy writes: "Hi my name is Stacy Elliott. I am the proud owner/momma of Layne Stayley AKA Layney our very loved tabby cat. He is now 9 years old and is a happy, loveable, goofy-meowing non-stop talker, loves to be around us, greeter at the door, mushing on his favorite "blankey" and carries his toys around the house for us to play with him. He is 100% loves attention, and since he was a kitten loves his photo to be taken. 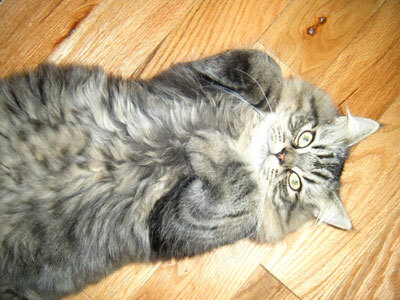 His favorite past-time is rolling on his back after a little catnip and meowing at us to play with him and brush him. I have had cats my entire life, but something about him is so special and I enjoy every moment with him. I am the lucky one to have found such a wonderful companion in him, I consider him my child that I never had:) He gives my husband and myself such happiness..I just want to kiss and snuggle with him with all my free time. " 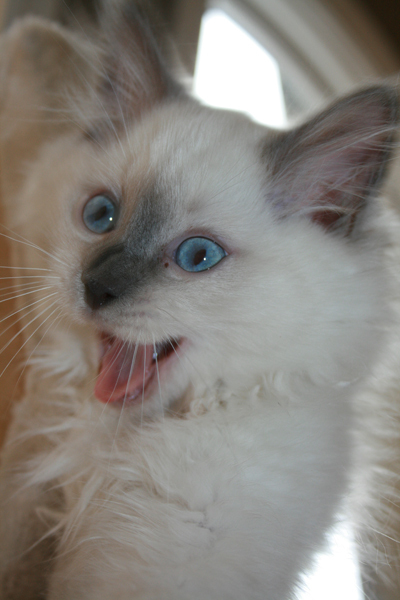 Rhonda writes: "Kasia is a very loving and happy little Ragdoll kitty. She loves attention and likes to pose for the camera. Kasia's favorite toy is the ring from the milk jug lid. 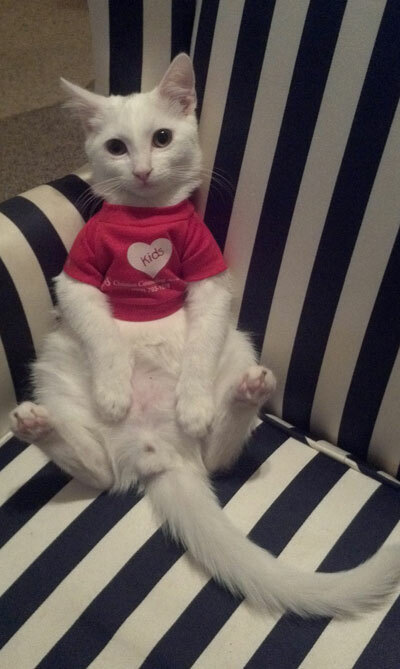 Kasia spends her time lounging on her cat tree or entertaining her staff (aka.. her humans). " Paul and Elizaveta Hudson writes: "We have owned Klitschko since he was 5 months old. 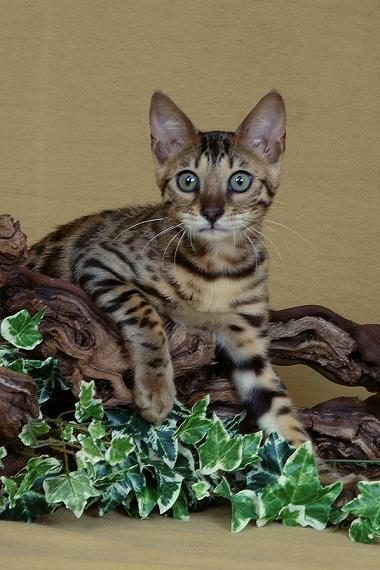 He is registared with TICA and his Father is a 45 pound Asian Leopard, and his mother is domestic short hair cat. Klitschko eats a raw diet with supplements that we get from Apperon. 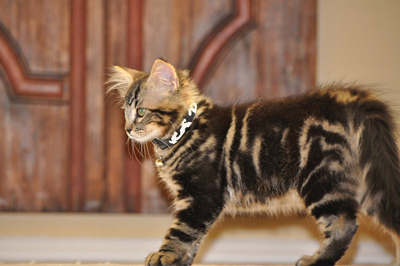 Klitschko weighs 22 pounds, and loves to walk on a leash. 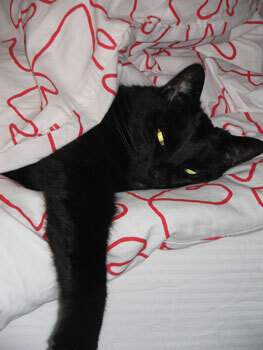 Everything about our cat is wild, he hunts everything and loves to sleep with you. " 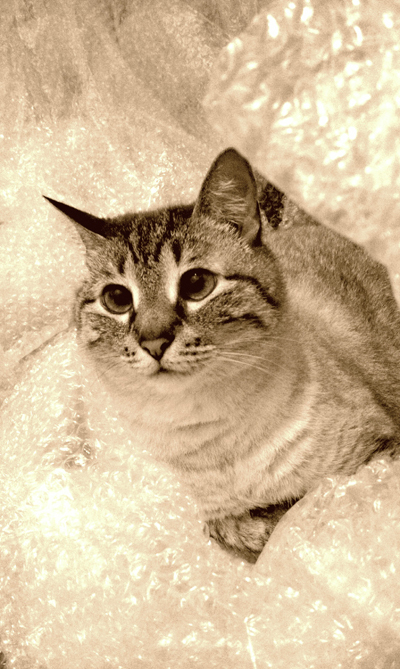 Anna writes: "Pandora was found in a box in a parking lot. The box she was found in was thrown out of a car window. She was about a week old since her eyes were not yet open and her ears not developed. We nursed her every 32 hrs around the clock for 2 days then every four hours. 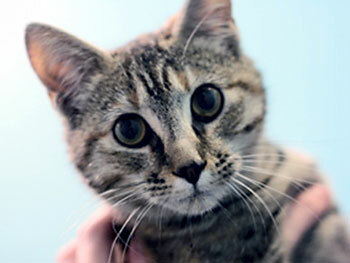 The doctors at the PSPCA did not expect her to live the night because of her size and no mother to nurse her. My son came home with her and she is now 3 months old, happy and healthy. " 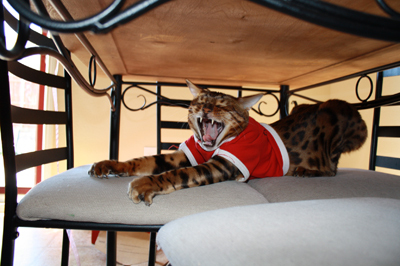 writes: "I am submitting a photo of my Valentino, as you can see this kitty is the king of his castle. 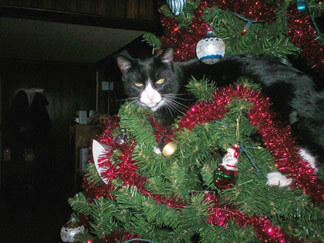 Valentino, BornChristmas Day 2007 has joined our home February 14, 2008. Our Vali, has a very unique way of sleeping : ) I hope he can be considered for the monthly contest. Happy New Year !!!!! " Tanya writes: "They are the best of buddies and awesome human companions, you will never find a more loving cat than these two. They love to play and groom each other. " Jessica writes: " A (somewhat wild) stray that was in my garage. I loved this little guy so much that I worked very hard to keep this cat around. Defiantly don't regret going through so much to enjoy the new orange fuzzy. " 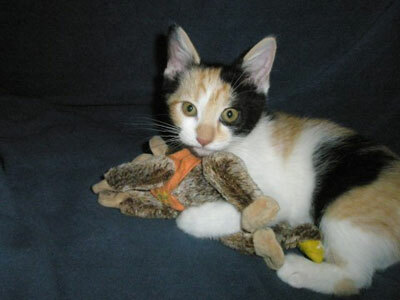 Mary writes: "Charli was given to us when she was just 3 weeks old after being found on a barn without a mother. Due to the lack of nurturing from her mother, we had to feed Charli formula until she was strong and healthy enough to eat solid food. Charli is now a healthy, happy, very energetic kitten. 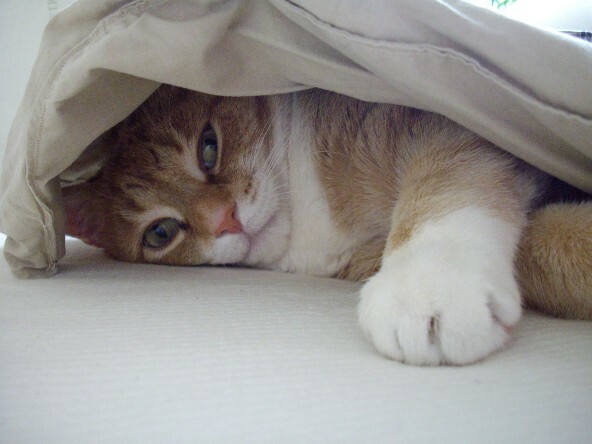 She enjoys long naps in my bed and is not at all shy when it comes to new friends "
Michael writes: " She loves ruining my house and being outdoors she is with us since birth and does a lot of showing in the Netherlands. 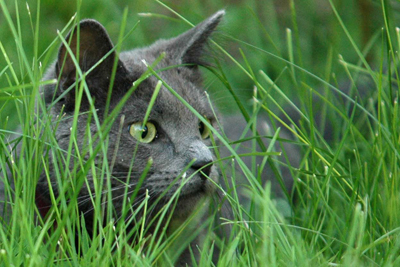 She likes to sneak outside and is very femalelike. " Jill writes: "Nellie was rescued from a shelter and quite scrawny when she came home with me, but she was so sweet and those eyes just melted my heart. Since then she�s filled out nicely and became a very beautiful girl. She�s a stray, so I am not sure of the breed, but according to the vet she should be about 18 months old. She�s super sweet and just getting to know her house mates. I think she thinks her new name is Nellie No, but she�s adjusting very nicely to her new home and resident cats. " Bethany writes: "Khaos is typically an orange blur in pictures as he is always running around and getting into things. 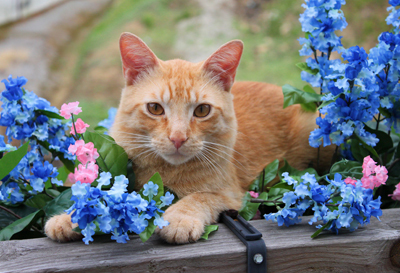 During his morning stroll he stopped for a second on the porch and posed for this photo. " 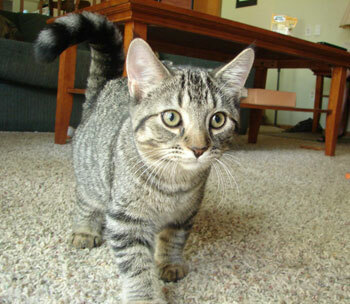 John writes: " We found him in the garage during a thunderstorm when he was around 6 weeks old. His owners decided they did not want two kittens and let him go. 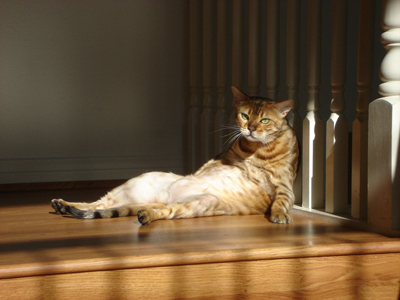 So their bad judgement is our good luck- he is such a friendly and loving cat "
Sarah writes: "He is part Ocicat, which brings out his wild side! He was abandoned early in his life. I started fostering him at 4 weeks old, and fell in love with his personality! " 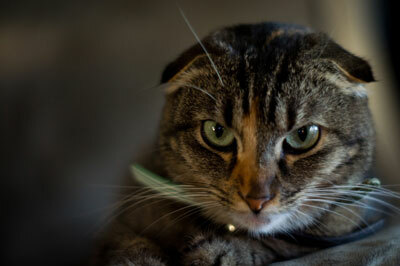 Steve writes: " Tecuya is a very social and talkative cat who will meow endlessly until her needs are met. She spends most of her awake time sunning and watching birds out the window. " Lena writes: "Tiger was given his name cause he "was a tiger found in the woods". We tried to find out if he belonged to anyone and no one claimed him so we kept him. " Taylor writes: " My name is Taylor and this is my cat Bullz-eye. He is 11 years old and a longhaired mix breed. He weighs over 25 pounds and he likes to sleep all day. His name is Bullz-eye because when he was a kitten, he had a bulls eye on each of his sides. 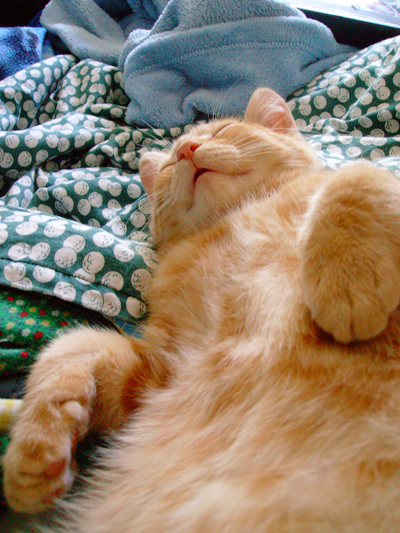 He likes to be carried around like a baby, sleep under blankets, and eat. " Renee' writes: "Puffy's mother had 9 kittens. Puff was the first one out of the box to look around. She is very even tempered and very loving. Everyone that meets her wants to take her home. " 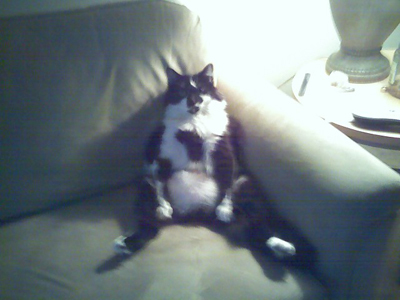 Teresa writes: " He is my 20 lb. HUNK A HUNK A BURNING LOVE! " Vivian writes: "We adopted Dash from Operation Kindness when he was only 8 weeks old. He is now 10 months old. He is very lovable. All you have to do is look at him and he starts purring. He has more curiosity than 10 cats combined. He is also very daring and a quick learn. If he tries something and it is a disaster, he doesn�t do it again. For example: He climbed to the top of our rug (8� x 8�) that hangs on the wall and starting at the top right corner it slowly peeled off the tack strip while he held on for dear life. He is very entertaining and a complete joy! " Angela writes: " Samantha showed up on our doorstep when she was just a baby and won over my husband's heart... she is a pure Daddy's girl. She likes different people but loves her Daddy! 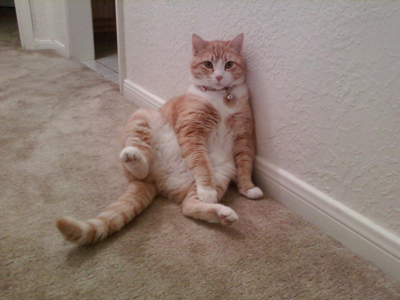 She's very graceful and quite comical to watch and loves to "sit up against the walls and see what everybody's doing." "
Jennifer writes: "We brought Tobe home when he was 5 weeks old and he is growing so fast. He enjoys eating, sleeping and playing. We are currently teaching Tobe how to walk on a leash so he can enjoy the outdoors. He gets a little more brave each time we take him out. Tobe has also said good-bye to his stinky litter box and is now using our toilet. " 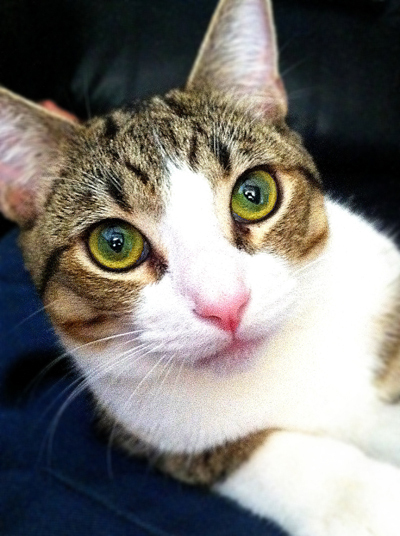 Becky writes: " We adopted Nermal from a rescue shelter. She was very shy and skidish when first got her, now she is so loving, and likes to cuddle, she also has a favorite red mouse that she carries everywhere! 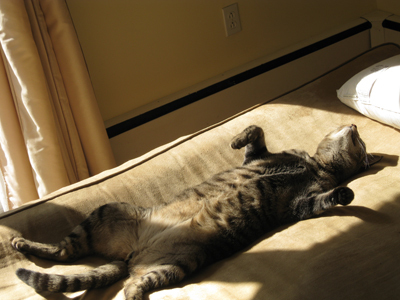 :) "
Rachel writes: "Nebbercracker was adopted from an animal shelter as a kitten in 2006. He was the last of his brothers & sisters to be adopted. His favorite activity is dragging clothing from our bedroom into the middle of the living room. " 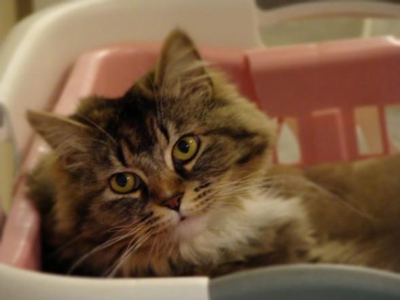 Paulette writes: " Maoey is an indoor cat who loves to sleep and play. 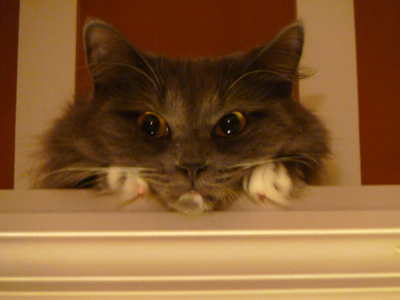 I mostly likes staying on the balcony, getting into cupboards and sleeping in the sink and bathtub. " Victoria writes: "Loving playful and sweet. Ashes was born from a mistaken litter. The breeder dumped him in my parking garage at 4 weeks old. I could hear him crying and he wouldn�t let me see him. I finally saw him eating with the feral cats I feed that lived in the apartment garage. I told myself that when he warmed up to me I would keep him. Two weeks later he let me hold him and the rest is history. " Brandi writes: " I received Ty when he was 2 months old as a gift from a friend and every day he still continues to be just that, a gift. Even when my day has gone badly Ty can always makes me smile. From door greeter, to entertainer, to kitchen floor belly slider, and best of all cuddly nose kisser, Ty has the all the moves needed to brighten someone's day. He is a wonderful friend and truly a blessing. " 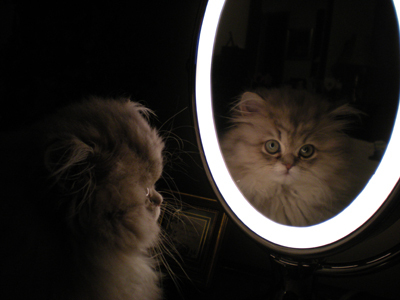 Jennifer writes: "Penelope loves looking at herself in the mirror- and who can blame her, she is such a pretty girl! " Susan writes: " We got Marley when he was just 6 weeks old. He is Very active and wants to play with everyone he meets. He loves being the center of attention! " Svetlana writes: "Our adorable Persian Cat's name is "Fuzzy" He's almost a year old We named him Fuzzy, because he's soooooo fuzzy...:) He loves to eat! ! !His favorite time of the day is MEAL time! He's always hungry. He's great with kids! He hugs you every time you pick him up. " Amy writes: " She has beautiful coloring and a sparkling personality. " 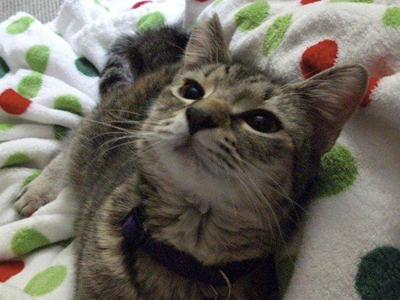 Deborah writes: "Alley was adopted from the Waco Humane Society in Waco, TX when she was 16 weeks old. She enjoys shiny balls and is not afraid to voice her opinion. 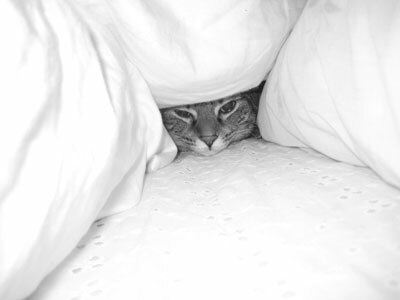 Picture is of her tunneling through pillows while I was trying to make the bed in the morning. " 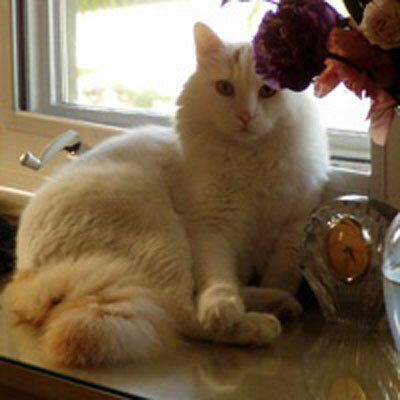 Michele writes: " Beautiful breed with playful clown-like behavior. Loves to be up (the higher the better.) Can leap tall buildings in a single bound, well, has been known to jump 7 feet#33; Loves to fetch, can spike his toys as if he is serving a volleyball....Chews on all papers so watch out! Most loving kitty.......my Romeo!" Nikki writes: "I rescued Sundae when she was about 1 month old. I found her in the middle of a busy road in a non-residential area on my way home from work one Sunday afternoon. I truly feel that her life was saved that day, and that if I didn't come along, she would have been a victim of oncoming traffic. She is such a beautiful kitten and the greatest joy to have! My friends and family adore her as well. She's extremely loving, curious, and entertaining. She has a dog-like personality, coming when called, following me around the house, sleeping next to me, and eating anything put in front of her. I am completely filled with happiness on being so lucky to find her! " Marlene writes: " Max has been with us now for about 4 1/2 years since we found him left in a empty apartment with no food/water or litter box. He was very sick and was left for dead. He had almost no hair and had a bad fever and only weighed about 4 pounds. We took him in and had to take him to the vet every week until finally he recovered. He is very lovable to everyone that comes to the door. Sometimes he acts like a dog because instead of running away when he hears the door bell he runs to the door and starts meowing excited to see whoever is at the door. 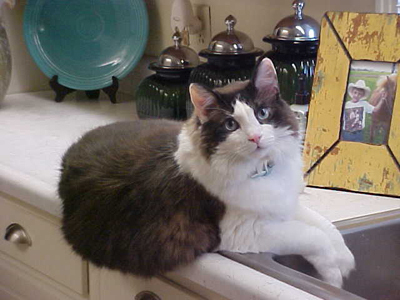 He loves to let us know when he has gone to the bathroom and loves to get his fresh cup of spring water every morning. He is now about 15 pounds and very healthy and very happy to be alive. " 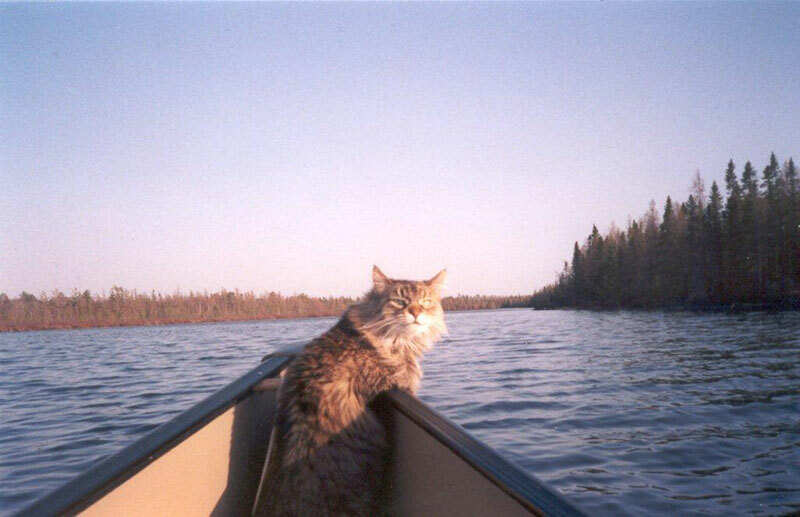 Kerry writes: "One of her favorite things to do is to go canoeing with us." 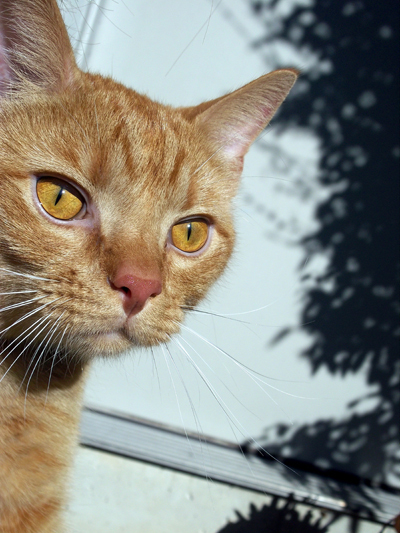 David writes: " I adopted him from a friend of mine when my friend passed away of cancer. 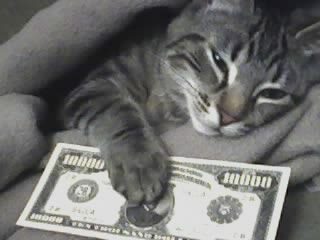 I didn't want another pet, however, now I couldn't get rid of frisky. This photo was taken of him when he woke from a nap under a blanket I made for him out of the shirts of his previous daddy. " Jennifer writes: "She is named after the Bridger moutainns and Gallatin river since she was born in Bozeman. She just goes by Bridgey tho. Bridget is an outdoor enthusiast. Al tho she is really considered an indoor cat. I take her camping, on hikes, and on the boat. She also enjoys riding by the back window of the car. She is good friends with her dog brother and likes to sniff his feet. She has a chin fettish, she likes to nibble on scruffy chins. She doesn't mind sporting cute sweaters when it gets chilly. 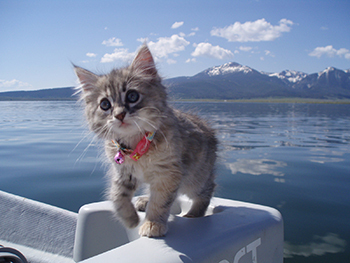 This picture is of her on Henry's Lake, MT. 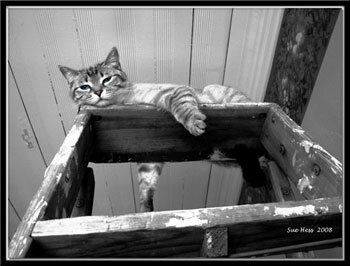 That's all for me-ow." 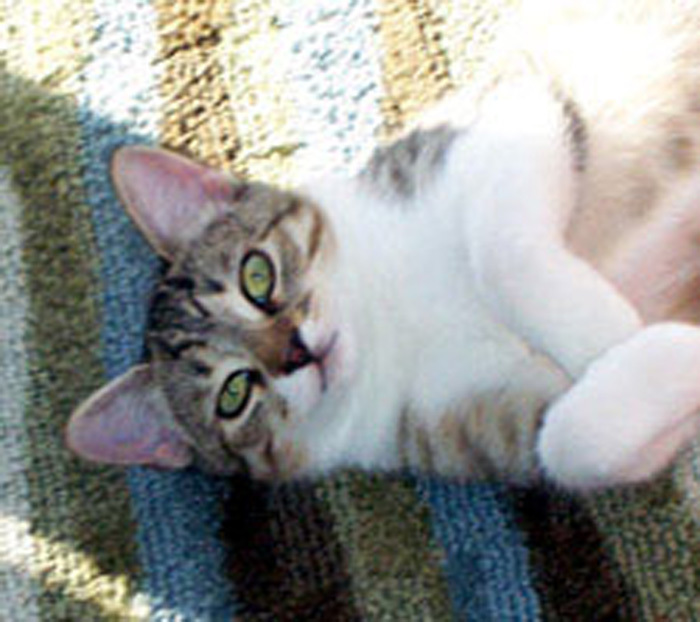 Julia writes: " Skyler was adopted from a Humane Society in 2004. He loves to play with his Best Friend, Bonzai the Boxer and with is very friendly and lovable with everyone he meets. 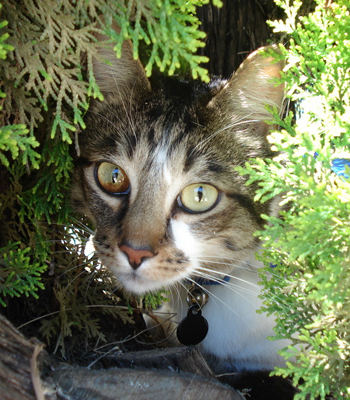 Skyler loves to Play Outside in his back yard, however mostly enjoys to sleep inside anywhere he pleases. He's very loved and his Blue eyes make him look very Charming." Jessica writes: "Billow was born in an old, abandoned freezer behind a bakery. He was found by a student of mine who tried to find him a home in class one day. None of my students seemed interested, so I decided to check out the litter. Billow was a tiny ball of fluff and really took to my husband, nuzzling in his lap. We were immediately taken by his adorable character and took him and his brother home that night. In the years since then, he has grown ever more loving and active�he practically flies while chasing his string of feathers! " 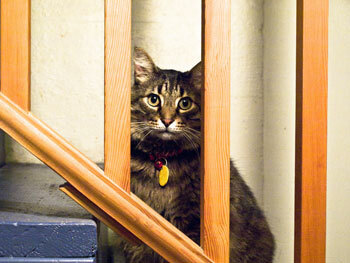 Carl writes: "We adopted Trouble from PAWS (Progressive Animal Welfare Society) in Seattle. He was found on the street and rescued by PAWS. He required some surgical care from a hip injury and was completely healed when we came to PAWS looking for a cat to adopt. He lives with us in Seattle with our two dogs. " 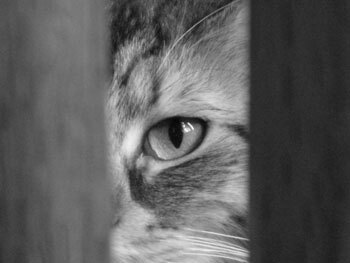 " Alex was a rescue from the City of Irving Animal Shelter. Originally I was fostering him to help him get over his fright and was able to find a home for him. Sadly he was brought back the next week because his leg had gotten broken and the family could not afford to help him with the medical cost. I knew that the shelter would not keep him and would either try to find a rescue or euthanize him. Since I knew the situation with most of the rescues because I am one of the volunteers that try to get cats & kittens out for rescue, I knew his rescue chances were slim as well. So my husband and I took him back. We took care of his medical bills and had his leg fixed. He was around 6 months old when that happened. Now he is a silly guy. He should have been named Squeaky because wherever he goes he lets out a little squeak. He is a very nice cat and totally loves attention. He gets along with all our other cats and plays with some. 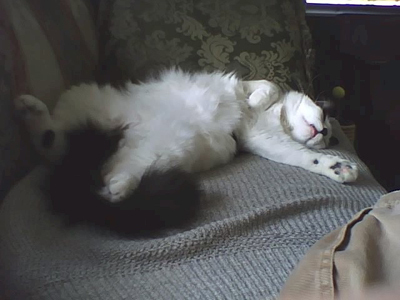 As you can tell from his photo he tends to sleep in strange positions. And for a cat he sleeps rather deep compared to our others. We are very glad we took him back and got him well and would miss him a lot if we didn't have him around. " Matt writes: "This cute little girl just barged right in when we opened the door. We kept her overnight while we tried to figure out where she belonged. We found her owner and took her home the next day. ... Other notes - Jordan was only 11 when she took this picture. " 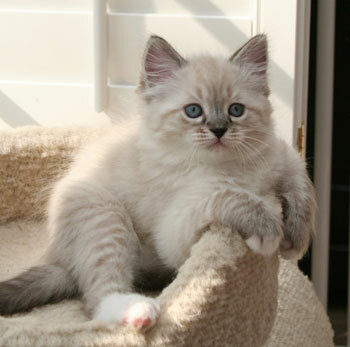 " Teddy is a purebred, seal lynx point RagaMuffin and is as sweet and floppy as can be "
Dianne writes: "My Dad found her on a rainy day in a hole in the street, it was filled with water and she was holding on with one paw. From that day on she has lived with me .. Surprisingly she loves water .. She wakes me up every morning to flush the toilet for some reason. She will stay in the tub for hours on end. She also plays with her water bowl getting my floor all wet. " 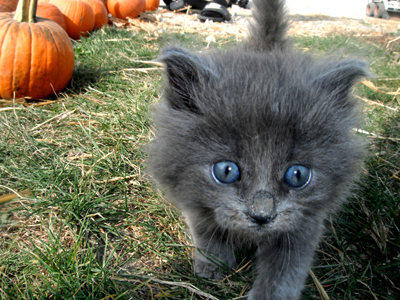 " Kutie was the only one who survived amongst a litter of kittens from a stray cay my dad adopted. Not long after Kutie's birth, her mom passed away. I found myself becoming a sudden mommy. Yes, it's been a decade and, thanks so much to my baby, I know I've actually become a better person. 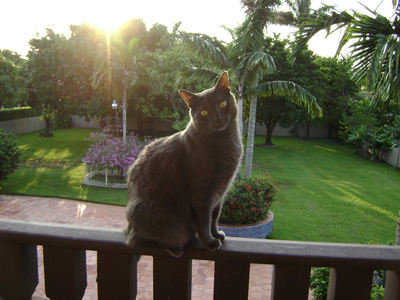 Kutie was also diagnosed with feline megacolon almost 5 years ago and since then, she has been on daily lactulose. Recently she was also prescribed a liver vitamin supplement. She takes her meds without any fight. She understands what they're for. Her diet also consists of high fiber oat bran cereals, imported from the US, that I buy from an organic grocery store. 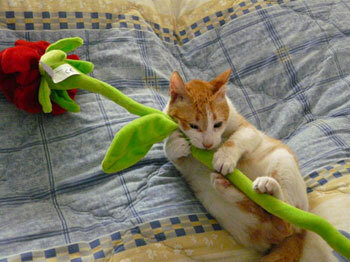 Hope she gets considered... this rose was a gift to me... but, of course, she needed to have it for herself.. "
Sue Hess writes: "Puss was adopted by my son, Jonathan, when she was about 8 weeks old. She lived in a farmhouse where many litters of kittens had been born that spring. Puss places herself quite high in the feline hierarchy. My son has taken in other cats temporarily and she considers them commoners and tolerates them until they move on to a new home. Puss loves kitty treats and spends her days begging for more treats or lounging around the house as if it were "her" castle. She is a petite pussycat and even though she is 2 years old now, weighs only 4 or 5 pounds." " We adopted him 2 years ago from our friends & he has been the love of our lives. " 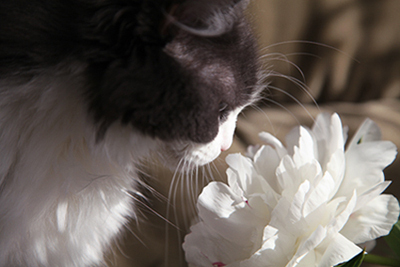 Crystal's husband adopted Zeus from an animal shelter after they lost their cat of 18 years. "Zeus was a very “wild” cat. It took us almost a year to tame him but now he is spoiled, loving and living the good life. 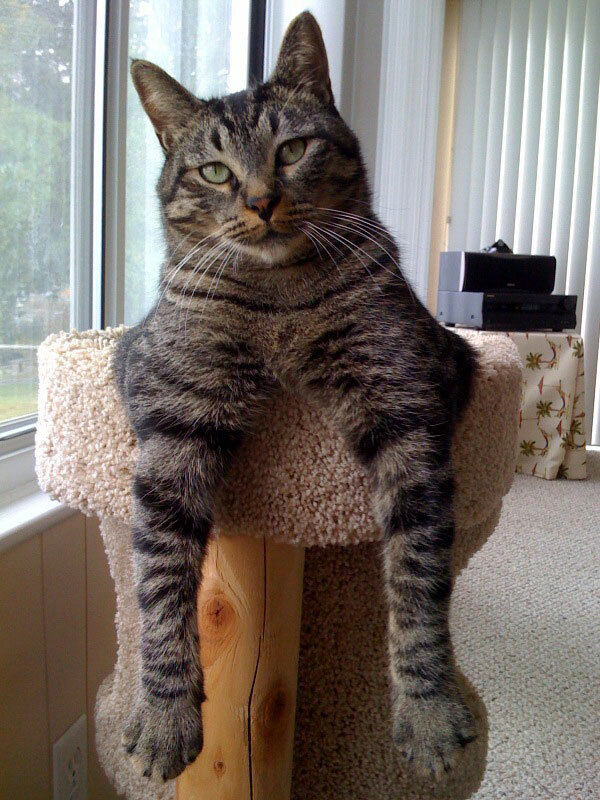 He loves to chill out as much as possible as you can see by the picture presented here." 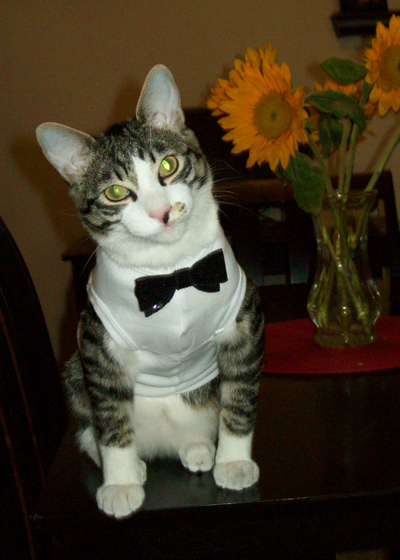 " He was thrown out in a trash bag as a kitten and rescued from the spca and I adopted him. He is the love of my life...great cat. " 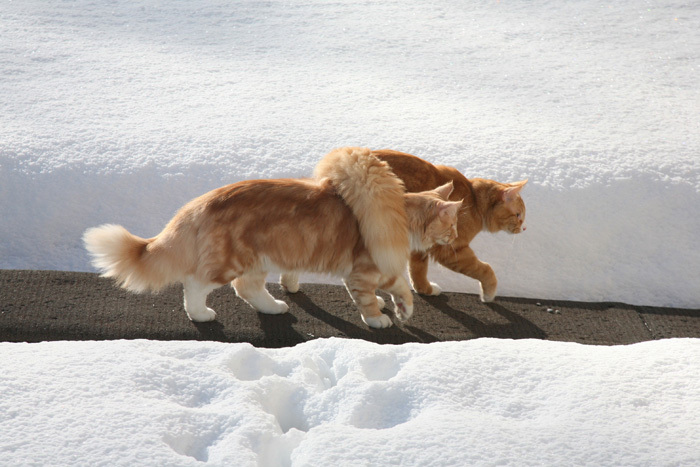 "'Maxi & Joyce together in the snow'. They were so happy in the snow and when I called them to come back in the house, Maxi came to me, to give me a hug and a kiss and he run away again, jumping into the snow, he wanted to show me, how happy he was in the snow, playing and running around. 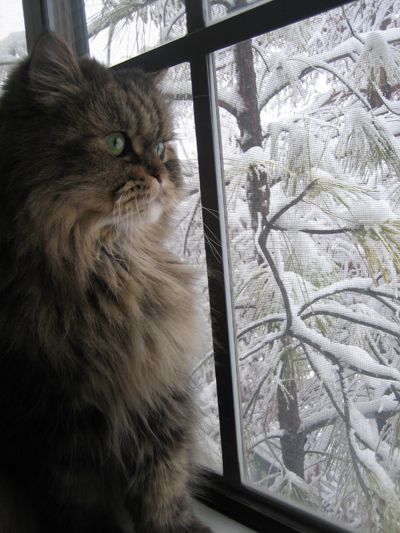 They are original from Norway ((Norwegian forest cats) but they live with us at Milano (Italy) and we took them with us two weeks on Christmas-holidays to Chamonix-Mont-Blanc in the French Alpes. They are always strangled together, everywhere they go, they go together. They are so lovely and they are so beautiful." "AnnaBell was 8 weeks old when I got her. 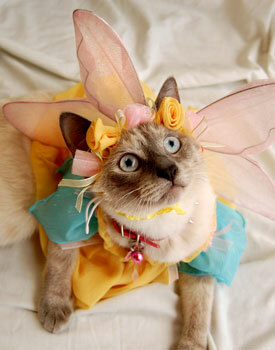 She is a Tabby. As you can see she loves sunbathing. AnnaBell also enjoys playing with her sister RajaBell and her brother Simon Blue. " "My cat's names are (left) Baby and (right) Brawler, they are only 5 months old and are mixed breed kitties. We live out of the city limits by an orchard and one day I spotted these little guys crawling out of the bushes when they were VERY little. They were completely wild and have had no interaction with humans. It took us about 2 months of feeding them and hanging around outside for them to finally come up to us. Slowly we were able to pet them and pick them up. 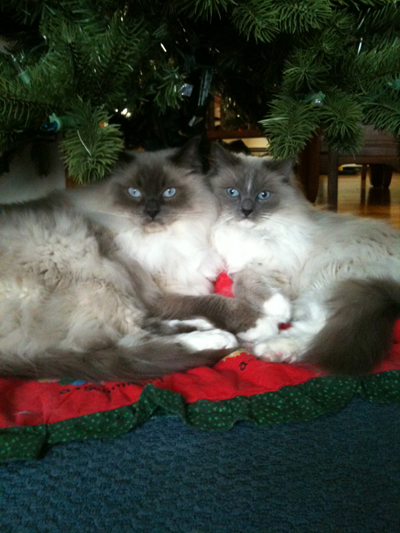 As soon as I picked them up,we brought them inside, and they have been treated like royalty ever since. " "As you can see she's not crazy about having her picture taken, but I can't resist, cause she has such a great personality. She thinks we put up that tree just for her! LOL! When she was a kitten it was cute, but now that she's bigger .. not so much, but we did put that thing in front of HER window, so we have nobody to blame but ourselves. LOL!"